For Sonesse 30 range 24 volt DC tubular motor. Radio motor, radio technology Somfy. Torque 17.7 pounds, speed 28 RPM. Slip in hooks for open headings. A commitment to quality. Our commitment to quality is steeped in tradition. Whether it's inspiration you seek or innovation you crave, energize your creative spirit with the drapery hardware collection by Graber. 14 per envelope. Zinc chromate finish. Zinc plated. For grommeted cubicle curtains or hand draw, pinch pleated draperies. Clearance 2 1/2 to 3 11/16 inches. Finish: clear vinyl. Kirsch's new decorative Metal Accessories can transform the everyday into an expression that is unique and personal. Medallions and Knobs, Holdback Extensions, End Caps and Swivel Sockets ... can function alone or"pleasant harmony with other Kirsch collections like Estate Ultra and Studio Coordinates. Six designs, five finishes, unlimited possibilities. Solution for decorative corner curtain rods in this adjustable corner elbow. also good for bay windows where the angle between windows is more than the 90 degree of a corner window. Metropolitan modern curtain rod corner elbow. Use with tab top curtains, eyelet curtains or pinch pleat draperies. Adjust from 90 to 180 degrees. Decorative drapery rods for your home. Studio Coordinates affords a custom look with stock convenience. Includes brackets and covers. HD27108P: Decorative curtain rods smooth finish, plain slides 100"-180"
Truck shipping only on this size. Brass finish metal. A cafe curtain rod by Kirsch. Order in 14 foot increments. Baton draw, ceiling or wall mount. For pinch pleat or Ripplefold drapery systems. Brass drapery rods require cleaning,Hanging a curtain rod instructions are furnished with each traverse rod. Alexandria gives you the brass look without the messy cleaning. Rods are metal, slides and finials are plastic.Projection 3 1/2 to 4 1/2 inches. by Graber. Single standard curtain rods 48-84"
Standard curtain rods, 2 1/2" projection, white finish. 4-425-1: Single standard curtain rods 84-120"
For use with Antique drapery rods, wrought iron finials and end caps. Nice drapery holdbacks. 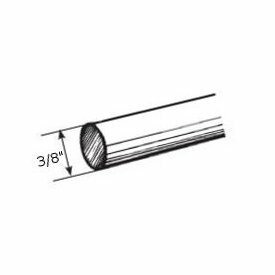 For 1 3/8" wood curtain rods. Kirsch's reputation for quality and elegance was built on Wood Trends. These classic styles in rich colors and subtle grains complement wood furniture finishes and architectural details, allowing for a totally original design statement. With a wide assortment of components such as elbow brackets, swivel sockets and holdbacks, Wood Trends is not only timely but also functional. Dimensions: 2 1/2" from wall to back of rod, 7/8" thick, base 3 3/4" high, and 5 1/4" to front of rod to wall. Instructions for hanging curtain rods are included. Graber curtain rod. White finish. Projection, 2 3/4 to 4 1/4 inches. Clearance 2 to 3 1/2 inches. A rod to be used with heavy fabrics. A commitment to quality. Window drapery rods by Graber. Graber super heavy duty features include a universal front loading end bracket, metal adjustable and reversible master carriers ball bearing end pulleys, a spring loaded side gate for adding or removing slides, molded, canted slides, can be converted to one way draw, scored center support base for easy mounting on narrow casings, universal cam lock stirrup, braided polyester cord, and angled tip on overlap arm. Kirsch HowTo books and brochures in PDF format. Must see for newbie customers looking for curtain rods, and traverse rods.